For more than just the deaf! Is it difficult for you to hold a book or turn the pages? Is large print too small to read comfortably? Do you miss reading books and magazines? If you answered yes to any of these questions, the Idaho Talking Book Service (TBS) can help. 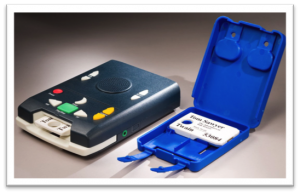 This free library service loans audio and Braille books and magazines, along with the easy-to-use players, to Idahoans who are unable to read standard print due to a physical disability. With more than 85,000 titles in its collection, in English and other languages, the TBS can meet the reading needs of everyone. Westerns, romances, mysteries, and other genres found in public libraries, as well as many titles by Idaho authors and about the Gem State and its history, are all available. Titles are mailed free postage for the Blind and Physically Handicapped, directly to users’ homes and returned the same way. The service is completely free to use. To register for the service, a person must have a qualifying condition, such as a visual or physical disability. Eligibility can be certified by a medical professional, social worker, librarian, or activities director in a care facility. Family members cannot certify their relatives. After an application is received, users are contacted by a TBS staff member, who reviews the application over the phone and sets up the new account just the way the patron wants it. Titles can be sent automatically, based on the patron’s preferences and requests as to authors, subjects, and/or genres. Or for a more personal approach, patrons are always welcome to contact the TBS staff, who are based in Boise, to make their requests over the phone. The toll-free number is 800.458.3271. TBS staff are available Monday through Friday, from 8 a.m. to 5 p.m., MT, except for federal and Idaho State holidays. Patrons may also call the knowledgeable TBS staff when they need to update their records or fine-tune their service. For example, a patron may find that they don’t care for a particular author or series of books — no problem. A TBS staff member can easily adjust their account to ensure that the patron receives titles they will enjoy. Or if a patron is heading south for the winter, books can be sent to the temporary address. Too busy to read for a while? The service can be temporarily suspended. Those with Internet access may utilize the Braille and Audio Recording Download, known as BARD, to download books and magazines. There is also a separate on-line library catalog that may be used to search for, and request, titles. For more information about TBS and to read more testimonials from users, such as the one below, visit the Idaho Commission for Libraries’ website at: http://libraries.idaho.gov/tbs or call 800.458.3271.